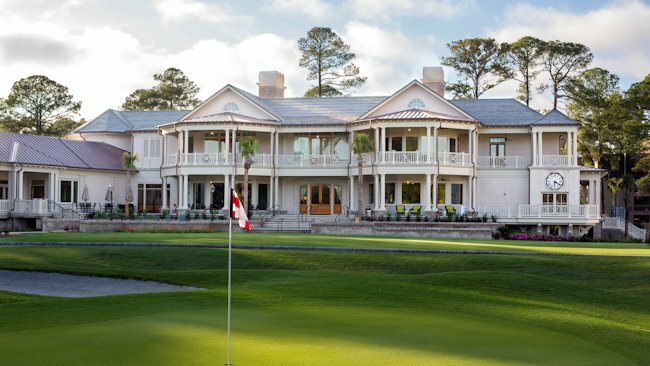 The Sea Pines Resort—host venue of the PGA Tour’s RBC Heritage Presented by Boeing, April 13–19—announces the opening of its new Harbour Town Clubhouse, serving famed Harbour Town Golf Links. Overlooking the Golden Bear’s first-ever design, a layout also featuring the work of Pete Dye, the 26,000-square-foot, multiuse structure will heighten the already memorable Harbour Town Golf Links experience for resort guests, members and touring professionals. Most notable is a dramatic gallery showcasing the rich RBC Heritage tournament history, with a roster of past champions, which includes Jack Nicklaus, Arnold Palmer, Tom Watson and Davis Love III. Additional highlights of the new clubhouse are a comfortable living room lounge; Links, a first-class American grill with indoor/outdoor seating and sweeping golf course views; signature pro shop and retail display; wrap-around terraces with covered porches; a state-of-the-art 4,000-square-foot locker room suited to meet the needs of PGA Tour golfers and everyday players alike; and the Heritage Room, an elegant 2,200-square-foot banquet and event room on the top floor. The clubhouse interior presents an inviting, open layout accented by appealing nuances and touches, including wood flooring from reclaimed 18-inch white oak planks as well as refined crown molding throughout the building. The ambience reflects the Lowcountry lifestyle at its best. The highly rated course first opened for play in time for the 1969 inaugural Heritage Golf Classic. The South Carolina Restaurant & Lodging Association recently recognized the property with the Hotelier of the Year award, honoring a deserving hospitality property annually based on exceptional customer service, community relations, and dedication to the advancement of the travel industry in South Carolina. Through the years, Harbour Town has also been ranked on Golf Digest’s lists of America’s 100 Greatest Golf Courses, Best In Rankings State-by-state, Reader’s Choice Rankings of The Top 50 Resort Courses, America’s 100 Greatest Public Courses, America’s Most Important Golf Courses by Decade, and America’s 75 Toughest Golf Courses. Top outlets Golf Advisor, Golfweek, Golf.com, and Golf Course Architecture magazine have also recognized the venerable layout. For more information, visit seapines.com or call 866-561-8802.